A gripping special of intrigue, heoism and tragedy. More powerful than fiction because it actually happened. "Tigers and Snakes" is the story of Z force and it’s men. It is the story of operation "JAYWICK" - a mission that should never have succeeded. It’s also the story of a follow up mission that went tragically wrong. Until now, little was known about the men of Z Force. They were sworn to secrecy. Z Special Unit, as they were known, would never speak of their experiences, not even to each other. 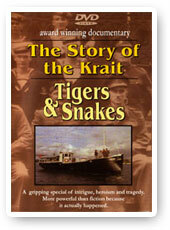 "Tigers & Snakes" takes you on the two missions to experience the intrigue, danger and emotions of men at war. Fourteen men and a tiny ex-Japanese fishing boat the "KRAIT" set out from Exmouth Gulf, to the islands south of Singapore. Reaching their destination, they transfer to canoes and armed with limpet mines proceed to destroy the forty thousand tons of Japanese shipping before returning through Japanese infested waters to Australia. The second mission "RIMAU" took place almost exactly one year later and with many of the original men. Their objective, much the same as the first mission, enter Singapore Harbour and sink as much as you can. With their target in sight, something went horribly wrong - not one man survived. Why? We talk to some of the survivors of Operation "JAYWICK" and find out why men volunteer for missions where violent death is an everyday experience.